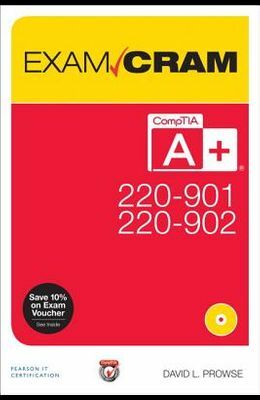 This is the perfect study guide to help you pass CompTIA(r) s new A+(r) 220-901 and 220-902 exams. It provides coverage and practice questions for every exam topic, including substantial new coverage of Windows 8/8.1, new PC hardware, tablets, smartphones, OS X, Linux, cloud computing, and professional-level networking and security. Extensive prep tools include quizzes, Exam Alerts, our great last-minute Cram Sheet, two full practice exams in the print book and an additional two exams in the test engine, plus complete real-time practice and feedback through Pearson s state-of-the-art test engine. You ll also find ten exclusive Real World Scenario case studies, all linked to simulations or video on the DVD Covers the critical information you ll need to know to score higher on your A+ 220-901 and 220-902 exams Deploy and manage desktops and notebooks running Windows 8.1/8, 7, Vista, OS X, or Linux Master and practice the six-step A+ troubleshooting process Understand, install, configure, and troubleshoot motherboards, CPUs, and memory Test and troubleshoot power-related problems Use all forms of storage, including SSDs, Blu-ray devices, and RAID systems Work effectively with mobile devices, including iOS, Android, and Windows tablets and smartphones Install, configure, and troubleshoot both visible and internal laptop components Configure Windows components and applications, use Windows administrative tools, and optimize Windows systems Repair damaged Windows environments and boot errors Work with audio and video subsystems, I/O devices, and new peripherals Install and manage both local and network printers Understand and work with networks, network hardware, wireless protocols, and cloud technologies Install and configure SOHO wired/wireless networks and troubleshoot connectivity Secure desktops and mobile devices, implement authentication methods, prevent malware attacks, and protect data EXCLUSIVE STATE-OF-THE-ART WEB-BASED TEST ENGINE WITH 320 PRACTICE QUESTIONS Make sure you re 100% ready for the real exam Detailed explanations of correct and incorrect answers Multiple test modes Random questions and order of answers Coverage of each current A+ exam objective David L. Prowse is an author, computer network specialist, and technical trainer. As a consultant, he installs and secures the latest computer and networking technologies. He gladly answers questions at www.davidlprowse.com.